In 1935, at about the same time Western Electric released the 300A power triode, RCA was putting the finishing touches on a new device dubbed the beam power tube. In a real sense, the 6L6 and its progeny became the 300B's commercial nemesis. And even though the 300B stayed in continuous production for 50 years, it had little impact on the hi-fi scene through tube audio's golden decades of the 50s and 60s. The problem then, as it is now, is that most audio gear is designed by engineers who are first and foremost concerned with specifications. A beam power tube push-pull output stage with sufficient global feedback looks really good on paper, at least into a resistive load, in output power, efficiency, and THD. Add distributed loading in the form of an Ultra-Linear connection and the resultant linearity exceeds even that offered by a push-pull triode output stage. In those days power amplifiers competed on the basis of specifications; most notably, power delivery and THD were assumed to be the final words in sound quality. Even in 1960, the single-ended triode amplifier (SET) seemed like an anachronistic relic of the past. It was left to Japanese audiophiles in the 1970s to re-ignite interest in the SET and high- efficiency speakers. The SET phenomenon spread in the 1980s from East to West, and the past 20 years have seen a multitude of various SET designs. Their claim to fame is the first watt. That is the notion that the first watt sets the stage for a high-efficiency speaker and that a single-ended amplifier, the king of Class A, delivers the best-sounding first watt. Surely, the next 99 watts hardly matter if that first watt is compromised. AT&T, the parent company of Western Electric, ceased production of the 300B in the fall of 1988. Since much of the SET resurgence centered around the 300B, production of 300B tube-types has continued, presently ongoing in China, Russia, and the Slovak Republic, and much of it in boutique fashion. The Frankenstein II's stock 300B tube is the Shuguang Treasure Black Bottle 300B-Z. In addition to a Western Electric 300B reissue, which is a faithful copy of the original, I was also fortunate to have on hand samples of the Sophia Electric Princess mesh-plate and carbon-plate 300B tubes. As you might have suspected, not all 300B types sound alike. Differences in grid and plate structure typically give rise to perceptible sonic characters. My objective was to sample a cross-section of the available 300B population with the end goal of identifying types that work best in the Frankenstein. Choice of operating point and output transformer primary impedance greatly influence sonic performance. Therefore, note the caveat that just because a particular tube sounds best in this context does not imply universal superiority. It would be foolhardy to generalize on the basis of a single output stage. The name of these amps is either a case of inspired marketing or simply represents a moment of geek. I presumed that it referred metaphorically to the act of bringing the music back to life. But when I asked Coincident's designer, Israel Blume, about it, this is what he had to say: "When I set out to design and create the Frankenstein, I thoroughly analyzed and studied every existing 300B amplifier typology as well as other DHTs [direct- heated triodes] like 2A3 and 45. In building countless prototypes and auditioning existing units, it became apparent that no one design contained all the necessary requirements for building the finest SET amplifier ever made. There were specific elements of one particular design that were desirable and other elements of other circuits that fit the mold. The end result became what I termed analogous to Dr. Frankenstein's creation." Mr. Blume's design goal was nothing less than "creating the purest, most transparent amplifier with the least electronic sound of its own, yet still capable of adequately driving sensibly designed loudspeakers." Toward that end, he says, "the circuit had to be a model of simplicity but not too simple; only the finest state-of-the-art components could be used; circuit layout and build-quality had to be based on not only hardwiring but as much lead-to-lead construction as possible; and the circuit had to consist of an input/driver tube, 300B output, and 5U4 rectifier." The input stage is built around a 6EM7 dual triode, which once upon a time was used in TV sets as a vertical-deflection oscillator. It combines high-gain and low-gain triodes in a single glass envelope. It has over the past few years been deployed as a stand-alone two-watt headphone amplifier because of its high-current-drive capability. In the Frankenstein, the high-gain triode is used as a voltage amplifier, while the low-gain/high- current triode is configured as a cathode follower and drives an interstage transformer (IT), a double-C-core type using 6N copper windings. Of course, the IT represents added cost, but Blume is a firm believer in eliminating coupling capacitors. Unusually, there are no capacitors in the signal path-only a single resistor. The IT drives the 300B in single-ended mode. The output transformer is also a double-C-core type, 6N-copper- wound. Both the IT and output transformers are wound in Japan to Coincident's specs. The 5U4 rectifier is followed by a choke input filter. No electrolytics here! All power-supply storage caps are polypropylene types. The power transformer is said to be operating at 30% capacity, which accounts for why these amps run cool to the touch and the absence of mechanical noise. Every detail, says Blume, no matter how seemingly small, had to be addressed in keeping with the philosophy that everything matters. For example, all internal wiring is 6N copper with air and Teflon dielectrics. Even the binding posts use solid quarter-inch posts of 6N copper. The Frankenstein is operated quite conservatively with a 300B plate dissipation of about 25 watts. That's only about 63% of the maximum plate dissipation. The cooler a tube runs the greater its longevity, and with the current cost of primo 300B tubes that's a good thing. The original Western Electric 300B was rated for an average life expectancy of 40,000 hours when operated within published specifications. It's not clear what life expectancy you'll get from the various electrically-equivalent types on the market. According to Blume, "The reliability record of the Frankensteins is a testament to the build-quality and overall design. Since we have switched to the Black Bottle 300B Treasure tube, we have not experienced a single failure in over two years." The Frankenstein's source impedance is said to be 1.8 ohms. That's pretty good for a tube amp, especially one with zero global feedback, and corresponds to a damping factor of about 4 relative to an 8-ohm load. The more critical issue is that any power amp with a high source impedance has the potential to modify the speaker's frequency response. In an ideal world, where speakers are blessed with a totally flat impedance magnitude, the amp's source impedance is not a factor. However, in the real world the impedance magnitude of a conventional speaker may vary by a factor of 10 or more across the bandwidth. At some frequencies the source impedance becomes a significant fraction of the speaker impedance, causing a drop in signal voltage due to a voltage-divider effect. The amp ends up dialing in EQ settings for the speaker, by preferentially reducing output in any frequency band associated with an impedance minimum. Since the impedance minimum of cone speaker systems is typically in the range of 100 to 400Hz, you would expect the most impact in the upper bass and lower midrange. Sure enough, when mated with the Basszilla Platinum Edition mk2 DIY speaker, the Franks were responsible for a slight loss of weight over the power range of an orchestra. A slight loss of tonal heft was also noted in the reproduction of an upright bass. Granted, such tonal-color changes may not be subjectively objectionable to many listeners, and considering the impact of room modes below 300Hz they may well be masked in some listening rooms. The Franks performed well with two of the three speaker loads they were matched with. Surprisingly, they were tripped up by the Klipsch Heresy III, which was on hand for low-power SET testing by virtue of its 99dB sensitivity. I happened to be measuring the frequency response of the Heresy with a series of power amps of varying damping factors. In every case, the frequency response in the highest octave (10kHz to 20kHz) was very uneventful, quite uniform in fact. With the Frankenstein in the loop, the upper-treble response became quite ragged exhibiting a 6dB dip followed by a 6dB peak. As you can imagine, the sound of this coupling resulted in muted tonal colors and a hard treble character. The Frankenstein excelled on my Basszilla DIY speakers. Its toughest challenger in this context was to be the Q-tron PA-12 OTL amplifier. This inverse Futterman circuit from Sweden is the finest OTL amplifier I've auditioned to date. This was to be a contest of polar opposites. No output transformer versus lots of iron in the signal path, and single-ended Class A versus a Class AB design. The Q-tron by virtue of its lower source impedance generated a more convincing tonal balance, and as expected, gave the impression of better extension in the bass and treble. It also earned an edge in transient speed and treble refinement. But once you get over the fact that the Franks are not state-of-the-art at the frequency extremes, you get a chance to marvel at their midrange reproduction. The Frankenstein's midrange was nothing short of amazing. Its ability to bring to life the music's underlying emotions, to light a fire under the soundstage, highlighted its mastery over a recording's embedded microdynamic information. The magic is in the details, especially when it comes to female voice. One speech researcher has observed that when viewed as a musical instrument, the larynx appears at first glance to be in the class of a plastic ukulele with rubber strings, making control over such an instrument a nearly impossible task. Yet singers are capable of pitch precision and subtle volume and pitch modulations that convey feelings and moods. This sort of micro-detail was vividly retrieved for my listening pleasure. There were plenty of "goosebump" moments. Dynamic shadings from soft to loud ramped up with startling speed and a superlative boogie factor. There were no problems at all with wide-range orchestral music. At times I found it hard to believe that I was listening to an 8Wpc amplifier. Why do SET amps sound sweet? Because that's what they do. One of the often stated engineering advantages of push-pull designs is the cancellation of even-order harmonic distortion products making it possible to arrive at THD figures of 0.1% and below. On the other hand, SET designs with zero feedback are lucky to make it below 1% THD. But most of that is second-order harmonic distortion that is not only consonant with the music but also contributes to the perception of midrange sweetness. The fundamental pitch of soprano voice is around 1320Hz, so that harmonics easily reach the upper midrange. In general, the Franks facilitated the transition to the upper midrange with a believable level of sweetness, unlike some SET amps sporting THD levels of 4 to 5%, which generate perceptible tonal- color shifts. Ultimate midrange quality was a function of the 300B brand. Although I consider the Treasure Black Bottle 300B-Z to be a decent choice, it was far from being my favorite in this application. To start with, the Western Electric reissues were responsible for incredible textural purity and lucidity of expression. In their presence you are guaranteed a healthy dose of 300B magic. My only complaint had to do with a spatial impression that was too self-contained. The Sophia Electric Princess carbon-plate turned out to be my overall favorite on the basis of offering the best balance of virtues. A true sonic princess! It proved to be adept at extracting the music's full emotional content while also managing to float a superbly delineated and spacious soundstage. Not only were image outlines palpable, but they bloomed spatially as the music expanded dynamically. Harmonic textures were so smooth that I could listen for hours on end. Based on previous experience with a mesh-anode 300B, I expected the Princess mesh-plate to tilt the presentation toward a livelier balance. That did not turn out to be the case. To be sure, this is also an excellent choice with only small sonic differences between the two plate types, but every one was in favor of the carbon-plate, which proved to be smoother, better focused, and a tad more vivid. The Franks deliver on the promise of SET-a midrange to die for, wonderful tonal color saturation, and spectacular imaging. In short, a sensational first watt! The Frankenstein is one of the best-sounding 300B SET amps I've auditioned to date at any price point. Don't let the price tag confuse the issue. According to Mr. Blume, "The reason the Franks sell for such a reasonable price given their high level of construction and performance is twofold: Price is based upon direct-to-consumer pricing. 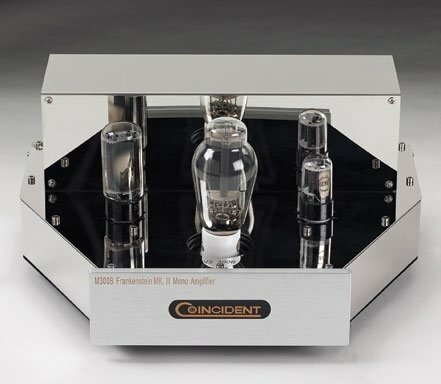 Coincident operates on the tightest mark ups in high-end audio." Given this level of affordability and performance makes for a screaming "buy recommendation." Married to a compatible speaker, you and the Franks will live happily ever after.